Tragedy unfolded last night during the Buenos Aires ‘clasico’ between San Lorenzo and Huracan. 24-yo Pablo Gimenez lost balance and fell from the edge of the home stand towards one of the exit routes. He was killed instantly. The young man fell onto another supporter, 33yo Esteban Otero. The man was leaving El Nuevgo Gasometro with his 4-year-old son just before the end of the game, when he was hit by Gimenez. Otero was taken to hospital with serious, but not life-threatening injuries. His son wasn’t hurt. The accident happened just before full time, when the home crowd was celebrating a 3:1 victory over Huracan. Despite numerous appeals by the speaker, many supporters were occupying fences and other areas possible to mount. According to local newspaper “Ole”, Gimenez was one of those fans. 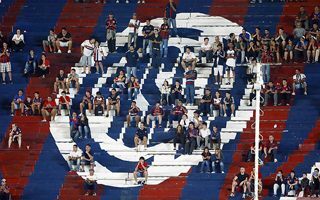 San Lorenzo issued a statement mourning the deceased fan, while highest officials of the club visited the other man in hospital.